It is often said that in order to shape the future you need to look back and understand the past. A colleague of mine recently asked: “when and what was the last great innovation in firefighting foam?” I have to admit, I had to think about the question and before I could answer he stated: “Aqueous Film Forming Foam (AFFF) in the early 1960s, at a time when vacuum tubes and black-and-white television were considered advanced technology and John F. Kennedy was the U.S. President.” This time period is considered the last significant innovation in firefighting foam – nearly some fifty years ago. So it got me thinking about the advancements in firefighting foam and where does the future of firefighting foams lie. The first question, of course is: what is firefighting foam? Separates the flames from the fuel surface. Retards vapor release from the fuel surface. Cools the fuel surface and any surrounding metal surfaces. Excludes oxygen from the flammable vapours. Finished foam is a combination of a foam concentrate, water, and air. When these three components are brought together in the proper proportions and mixed, foam is produced. 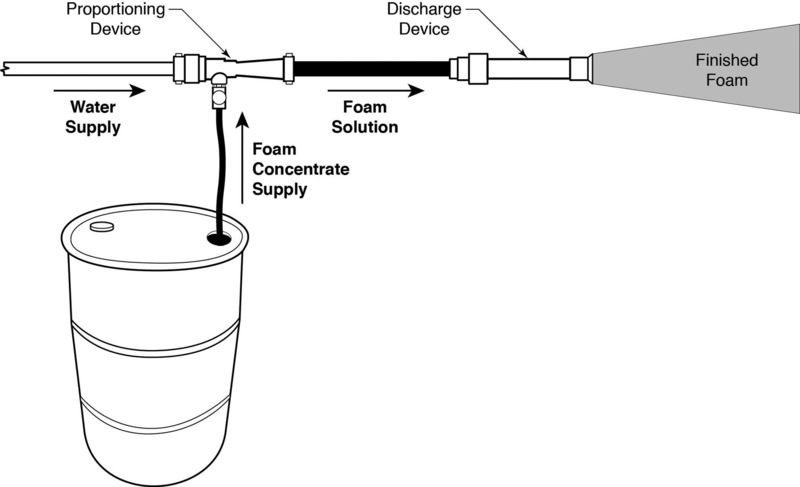 The figure opposite shows how the final foam is made through a typical proportioning device. Knockdown Speed and Flow: This refers to the time required for the foam blanket to spread across a fuel surface or around obstacles in order to achieve complete extinguishment. Heat Resistance: Foam must be able to resist the effects of heat from any remaining fire from the liquid’s flammable vapour or heated objects. Fuel Resistance: Effective foam minimises fuel pick-up so that the foam does not become saturated and burn. Vapour Suppression: A vapour-tight blanket must be capable of suppressing the flammable vapours and minimise the rise of reigniting. Alcohol Resistance: Foam blankets are more than 90 percent water. Because of this, foam blankets that are not alcohol resistant will not last very long. Each type of firefighting foam has its applications. Use applications range from wild-land and structural firefighting to industrial high-hazard, high-risk applications found in aviation, chemical, defense, energy, marine, mining, oil and gas, petrochemical, pharmaceutical, pipeline and solvents and coatings industries. Firefighting foams are divided into two classifications Class A and Class B. Developed in the mid-1980s, Class A foam was predominately used for wild-land fires but as its popularity grew throughout the 1990s the use of Class A foam was expanded for use on structural fires. Class A fires consist of ordinary combustible materials, such as paper, cloth, wood, and plastics. These type fuels require the heat-absorbing effects of water (cooling) or water solutions. Class A fires consist of two types: flaming combustion involving gases that result from the thermal decomposition of the fuel. The second type is deep-seated or glowing. This type represents combustion within the mass of the fuel and has a slow rate of heat loss and a slow rate of reaction between oxygen and fuel. As a synthetic based foam concentrate, Class A foam is applied at low concentrations ranging from 0.1% to 1.0% (see application rates below). Cooling and wetting are the primary extinguishing mechanisms. The use of Class A foam makes “water wetter” on average increasing the effectiveness of water tenfold. Note: the minimum admixture rate on other Class A fuel types are 0.1%. 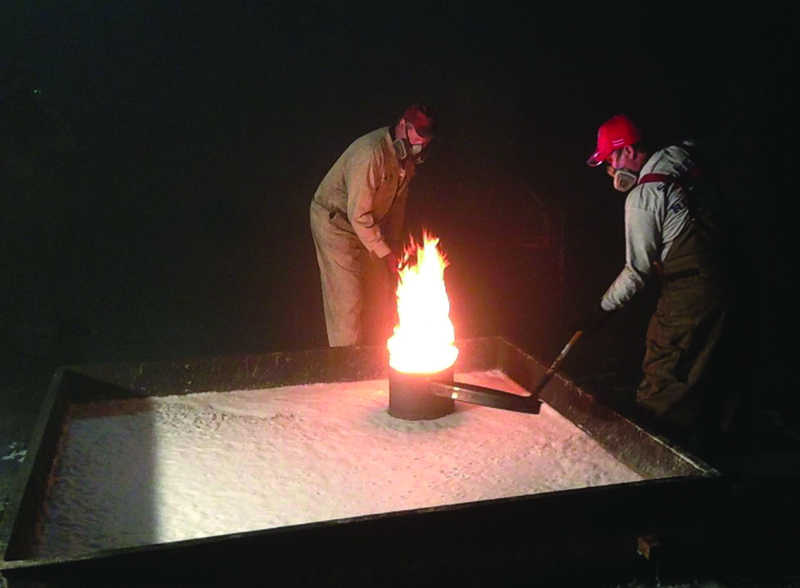 These application rates make the use of Class A foam a cost effective means of combating fires because smaller amounts of foam concentrate can be used to make effective foam. Class A foam is biodegradable and non-toxic, so it is environmentally sustainable. Class A foam is deployed through a variety of portable and fixed appliance devices ranging from firefighters’ backpacks, brush and fire apparatus, to rotary and fixed wing aircraft. As we look to the future, the use of and application for Class A foam will certainly advance technologically. A current example to point to is the recent generations of nozzle-aspirated induction systems and compress air foam systems (CAFS) have been more reliable than earlier generation models. There are several types of available foams. Each foam concentrate is developed for a specific application. Some firefighting foams are thick and form a heavy, heat-resistant covering over a burning liquid surface. Other types of foams are thinner and because of that, they will spread much more quickly over the fuel surface. Still, other types of foams will generate a vapour sealing film on the surface of the fuel. Additional foam concentrate types, such as medium and high expansion foams, can be used in applications requiring large volumes to flood surfaces and fill cavities within the hazard. These foams are produced by the chemical reaction that occurs when the two chemicals, aluminium sulphate and sodium bicarbonate and mixed together. The energy required to create the foam bubbles comes from this reaction between the two chemicals. This type of foam is obsolete. Protein foams are manufactured with naturally-occurring sources of protein, such as hoof and horn meal or feather meal. They are intended for use on hydrocarbon fuels only. Foam made from protein foam concentrates usually have good heat stability and resist burn-back. They must be properly aspirated and should not be used with non-air aspirating fog nozzles. These foams are generally not as mobile or fluid on the fuel surface as other types of low expansion foams. Protein foams are susceptible to fuel pick-up, therefore, care should be taken to minimise the foam and fuel from submerging. This type of foam concentrate is based on a mixture of surfactants and solvents, both fluorinated and fluorosurfactant/fluoropolymer-free. These types of foam concentrates may or may not form films or membranes on the fuel surface, depending on the foam concentrate and the fuel being protected. Fluoroprotein foams are a derivative of protein foams. Fluoroprotein foams have fluorochemical surfactants added. They are intended for use on hydrocarbon fuels and selected oxygenated fuels. They must be properly aspirated and should not be used with non-air aspirating fog nozzles. Class B fires consist of flammable or combustible gases, and liquids. 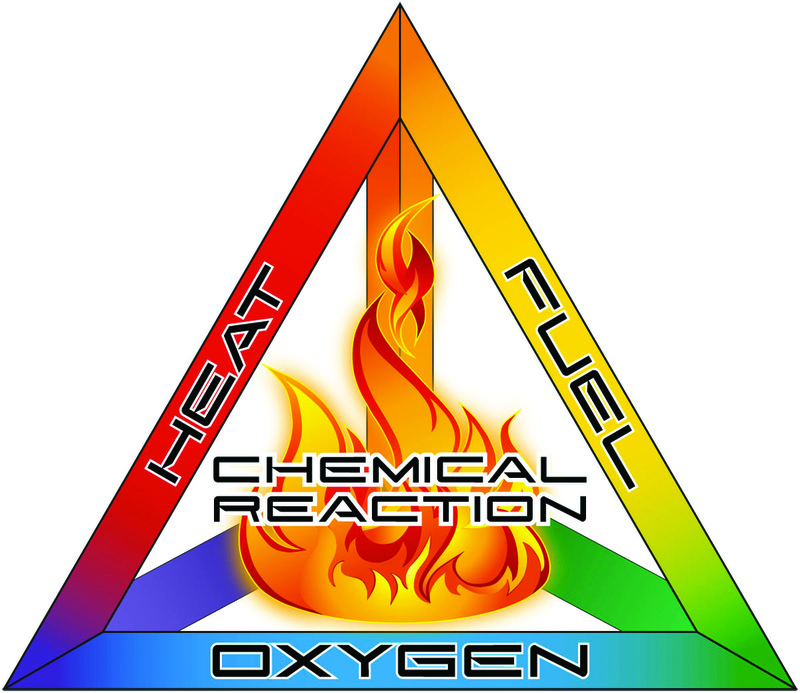 Extinguishment is normally accomplished by excluding (eliminating) oxygen, interrupting the combustion of the chain reaction, or stopping the release of the combustible vapours. The type of Class B hazards are either water soluble (meaning they mix with water) [for example, polar solvents] or water insoluble (meaning they will not mix with water) [for example, hydrocarbons]. For water-soluble fuels, special alcohol resistant foam agents that will not mix with the fuel are required. 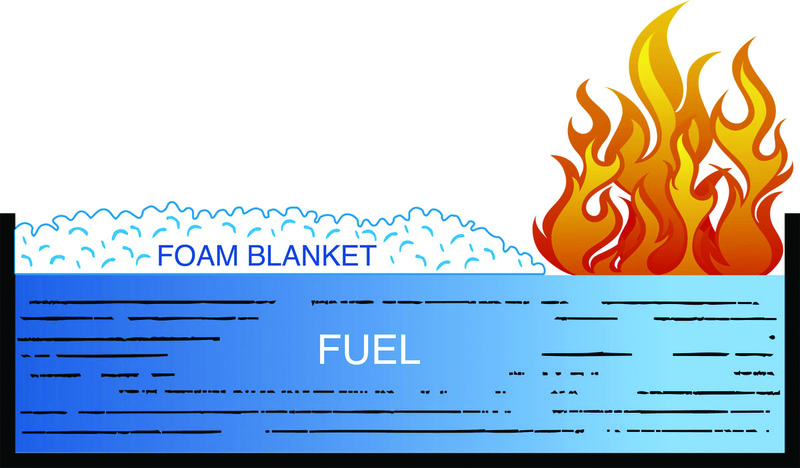 Fire Prevention: Application of a foam blanket on an unignited spill. Vapour Suppression: Prevention of vapours from finding an ignition source. Odour Control: Suppression of hazardous or noxious vapours. Personnel Exposure: Protection of fire and/or rescue personnel during emergency operations. Asset Protection: Pre- and post-security of the hazard until securement or removal is conducted. Class B foam is not effective on all types of fires. It is critical to know the type of fire and fuel involved. Firefighting foam is not effective on: Class C Fires (energised electrical equipment) as water conducts electricity and foam contains 90 percent-plus water. Class C fires can be extinguished by either de-energising the equipment or using alternative extinguishing media such as dry chemical, carbon dioxide or a clean agent; pressurised gases – materials stored as liquids but are vaporous at ambient temperature. The vapour pressure for these type fuels is too high for foam to be effective; three-dimensional fires – in which the flammable liquid is being discharged from an elevated source creating a pool fire on a lower surface area; Class D fires – combustible metals such as aluminium, magnesium, potassium, sodium and titanium alloys. The extinguishment of Class D metals requires the use of specialised dry powder agents. Firefighting foams have been on the market for almost 100 years in various types. Firefighting foams started with chemical foams, at each of these steps along the way, performance and safety of these various agents improved on the prior foam agent types/concentration. Early 1900s: The first firefighting foams were chemical foams. They functioned by a chemical reaction from mixing two or more chemicals at the time of use, which created the foaming. More effective than water, but difficult to use and transport. Also, there was always the risk of improper mixing at the time of use. 1930s: Protein foams were a major improvement. They were chemically stable and effective on Class B fires. At that time, they quickly became the industry standard. Their major drawback was limited shelf life and limited storage temperatures, issues that are still problems for protein-based products today. Also, protein foams work best when they are discharged through air aspirating equipment that creates a thick foam blanket, but depending on the type of foam discharge equipment, can negatively affect the discharge range compared to non-aspirated equipment. 1960s: Synthetics (AFFF and AR-AFFF) entered the market. They have the ability to readily spread over a fuel surface, are very forgiving during a fire, they can be discharged through all types of nozzles, and have an extended shelf life. Fluorinated synthetic foams are the mainstay of the foam fire protection industry, and have only recently been under review, not for their firefighting performance, but due to their environmental impact. Current synthetics are capable of extinguishing hydrocarbon and water soluble fuels, and can be discharged through air aspirating and non-aspirating nozzles, allowing maximum flexibility during use. Mid-1960s: Fluorprotein foam was introduced after the synthetics, mainly as a market response by the protein foam manufacturers. 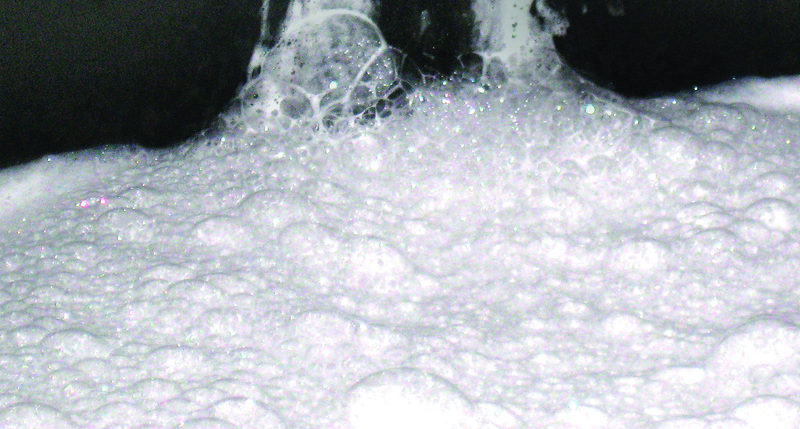 Adding fluorosurfactant to standard protein foams allowed the protein foams to more readily spread on the fuel surface. This step improved the performance of the protein based foams to somewhere between protein only foam and the fluorinated synthetics. 2005/Present: As environmental regulations on fluorinated synthetic foam concentrates increase around the world, a new generation of environment friendly foam concentrates is being developed. These concentrates are environmentally sustainable fluorosurfactant and fluoropolymer-free firefighting foam used to effectively extinguish Class B fuels with no environmental or toxic breakdown. They are synthetic based foam technology designed to replace traditional AFFF and AR-AFFF foam concentrates and older fluoroprotein foams. As I mentioned at the start of this article, firefighting foams have been used for the extinguishment of fire for almost 100 years in various types. Firefighting foams started with chemical foams, and at each of the advancement steps along the way, performance and safety of those agents improved on the prior foam concentrate type. Despite the importance and need for firefighting foam today, the last significant development efforts occurred in the 1960s with the commercialisation of AFFF for Class B foams, and the 1980s for Class A foam, now some fifty and twenty years ago respectively. So what will the future hold? Surely the developments in induction systems for Class A foam (and perhaps the agent chemistry) will continue to advance as it has over the past decade. But as for Class B foam concentrates, agent chemistry development efforts seem to have been frozen in time with reliance on exiting base technologies. Only since the introduction of environmental regulations over the past five years or so on fluorine containing AFFF’s have the manufacturers of firefighting foam taken the development challenge seriously. These fluorine-free products (some first generation and others second or third generation) will continue to evolve in both agent chemistry and firefighting performance with the goal of achieving high performance on flammable and combustible liquids, improved burn-back resistance for firefighter safety and provide for many additional years of shelf life over foams derived from protein.